When August comes around I am pretty much NEVER ready. August is like a ticking time bomb – a constant reminder to soak up every little ounce of summer left before the leaves change and the white stuff comes… I won’t say it. Not yet. We just got back from my family’s annual camping trip to the Georgian Bay in Ontario and it’s kind of the final big hurrah of the summer. 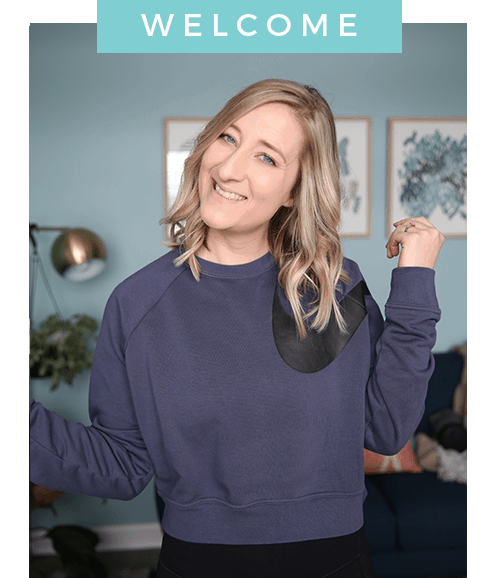 I did my absolute best to stay present so I could come back feeling refreshed and ready to take on the rest of the year in full out beast mode. 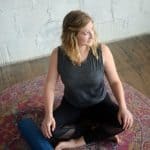 (Three bridal showers, three bachelorettes, work travel, three weddings – it’s gonna get cray.) It’s amazing what a little fresh air, plenty of time in the lake, spotty cell service and just hanging with your favorite people will do for the soul. I’ve said it before but I’ll say it again, SO much to love about summertime. 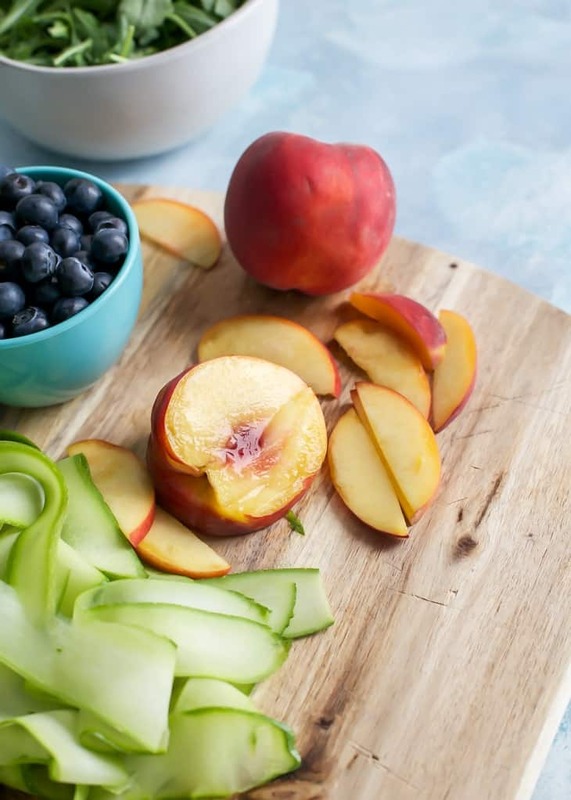 And if we’re bringing it back to the food (because that’s why most of you are here, I assume) I’m talking all the amazing fresh fruit that comes our way during summer. And with August here that means PEACHES. I hope you’re not one of those people who dislike adding fruit to their salads. It’s such a nice addition to the leafy greens. My big thing for people who say they don’t like salads is to really load it up with other things you *do* like. 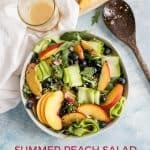 Salads aren’t meant to be boring – don’t be afraid to pile your favorite toppings on– Fruit, different veggies, some nuts for crunch, a grain for a nice hearty base. In moderation, of course. Seriously, salads are not scary – they’re amazing and make us feel awesome. Now with pretty much any salad, they’re fairly customizable. If you see anything in here you don’t love, omit or replace it with something you do like. You can prep the quinoa ahead of time (I like the Instant Pot for this) and shake up the dressing in a jar. I like to toss together the quinoa and arugula together first in about 2 tablespoons of dressing before adding on the rest of the toppings and drizzling on some more dressing. 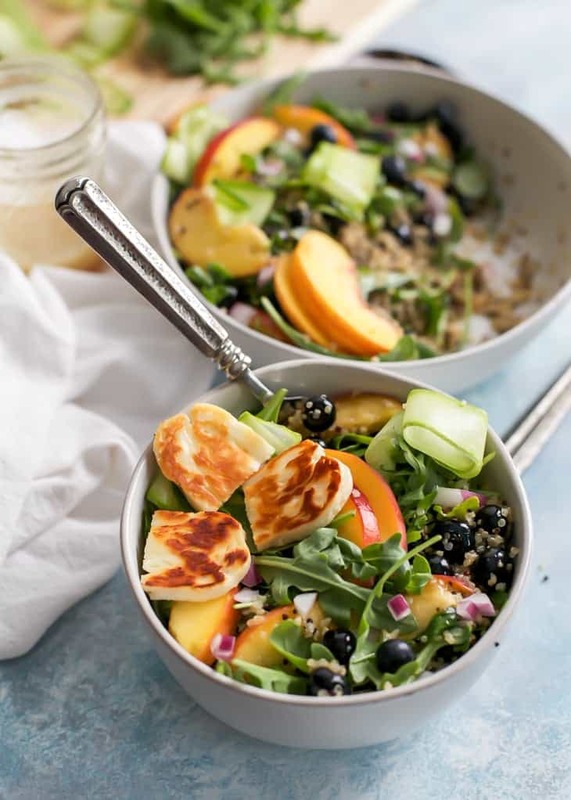 OH, and if you’re feeling super cool (and *ahem*, not vegan) try frying up some halloumi for this salad. It’s DELISH. Not familiar with halloumi? It’s a semi-hard cheese made from a mix of goat and sheep’s milk. It’s kind of like feta, but not as strong. I found mine at Whole Foods. And yes, the price tag may raise the eyebrows a touch. But just trust me – it’s worth the splurge. 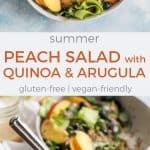 This Summer Peach Salad with Quinoa and Arugula is perfect for lunch or even a dinner side. 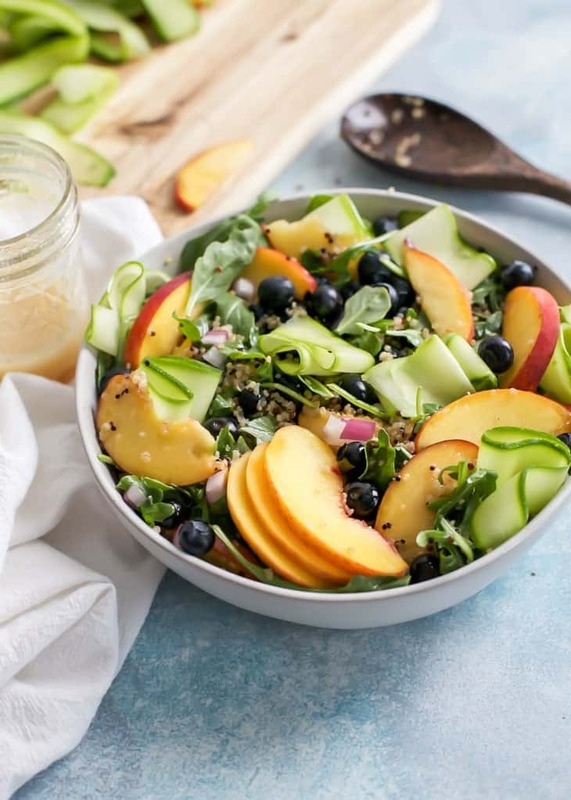 Fresh peaches and blueberries combined with zucchini ribbons, quinoa and a honey vinaigrette. Gluten-free recipe, vegan-friendly. Make the dressing: Add dressing ingredients into bottle/jar and secure with lid, shake vigorously until mixed. Or use bowl and whisk. 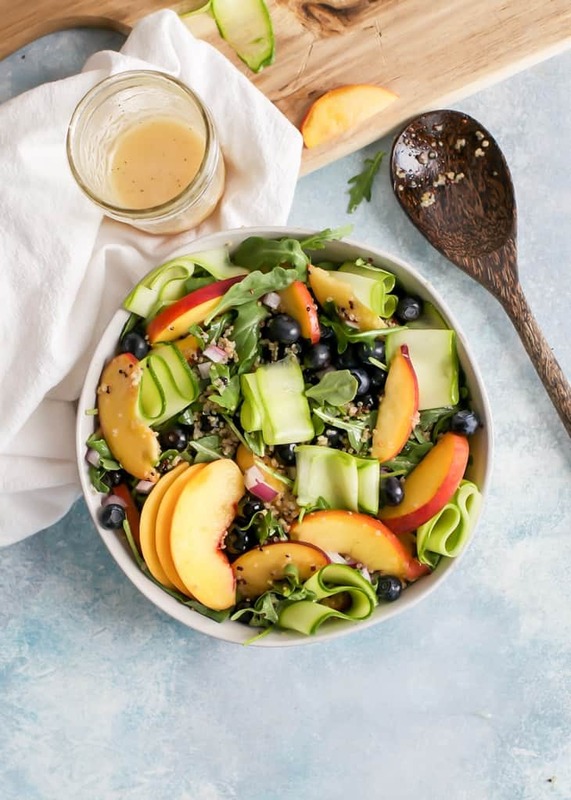 Assemble the salad: Gently toss quinoa with arugula; drizzle on about 2-3 tablespoons of dressing, or as much as desired, and toss again. 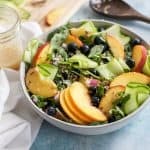 Add peach slices, blueberries, and zucchini ribbons. Sprinkle on diced red onions. Set aside. Fry halloumi: in small frying pan over medium heat, add butter or oil to heated pan. Add slices of halloumi and fry one side until golden, about 2-3 minutes, before flipping to other side and frying again for another 2-3 minutes. Remove pan from heat and gently place halloumi on salad. Serve with more dressing and enjoy! Peaches are the BEST. I wouldn’t stop at one, that’s for sure! I eat a large salad every single day and make sure to pack in the greens and vegetables like mad. There’s no better way to incorporate more nutrients and healthy foods that way!